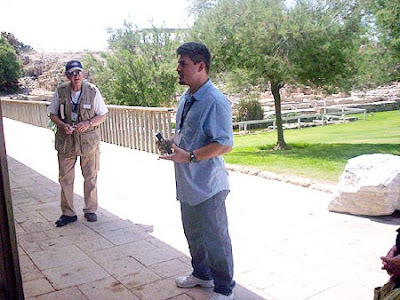 Welcome along to Day 4 of our Lamb & Lion Ministries' 2009 Israel tour! Today we left the beautiful seaside city of Tel Aviv and headed north along the flower-covered highway. The highway trip proves that Israel, once a barren wasteland, is now a garden once more. 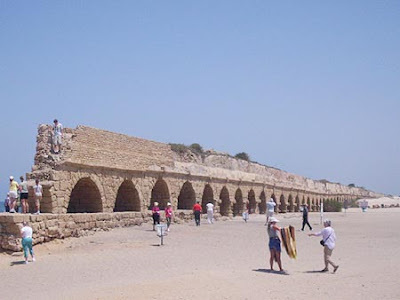 Our first stop was to visit the ruins at Caesarea Maritime, the once Roman capital of Judea. 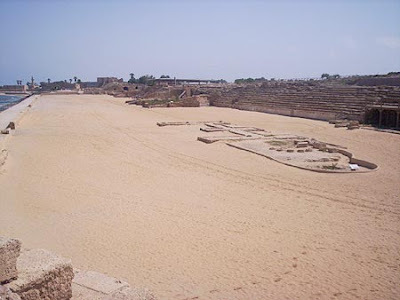 Caesarea Maritime, the Roman capital of Judea... or what's left of it! 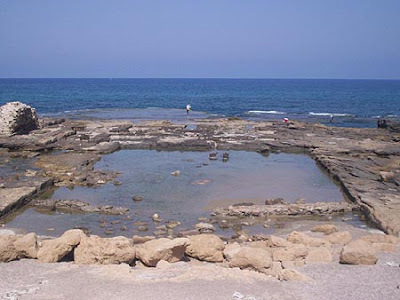 Built by Herod the Great, this was the palace's seaside pool. The palace pool was filled by fresh water using an aquaduct that imported water from Mt. Carmel some 10 miles away. Oh, the 100,000 other townsfolks got to drink from it, too. 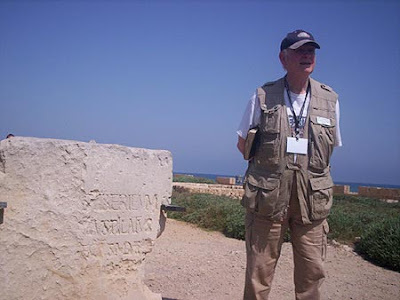 Dr. Reagan stands by the Pilate Stone, extra-biblical evidence proving Pilate was a real historical figure. 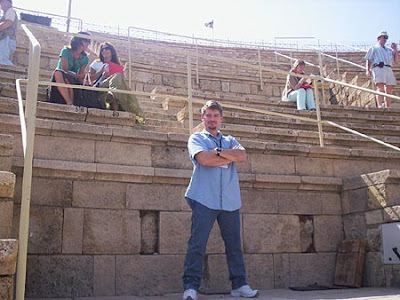 I stand in the Ampitheater on the spot where Herod Agrippa's throne once stood. Herod was called a god there and then died 5 days later throwing up worms. The Hippodrome, where 2,500 Jews were slaughtered in 70 A.D. in gladitorial games. This would be the arena of the great chariot race from Ben Hur. I'm giving the devotional for this site. The great Roman capital is now in ruins, built on a foundation that washed out to sea. The only foundation that will never fail us is Jesus Christ. 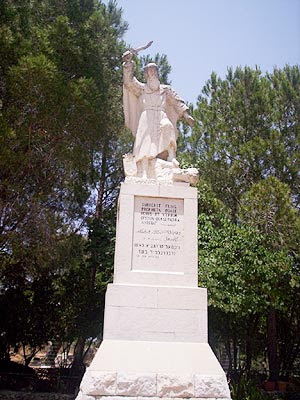 This statue is on the top of Mount Carmel, where Elijah tested and slew the prophets of Baal (1 Kings 18). 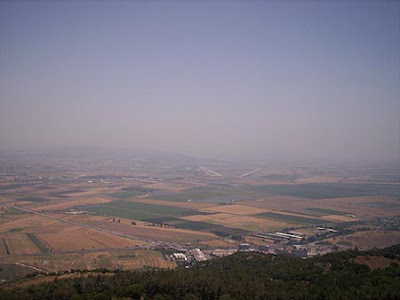 From the roof of the Carmelite Monestary the entire Valley of Jezreel (Armageddon) can be seen. Dr. Reagan summed up the end-time battles that will be fought in this prophetic location. 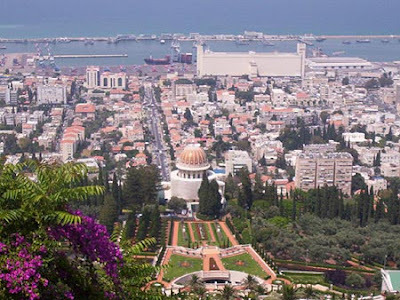 The college town of Haifa is home to Israel's great oil port. It also houses the Bahai temple and gardens. Up to Akko to tour the Crusader's Fortress. 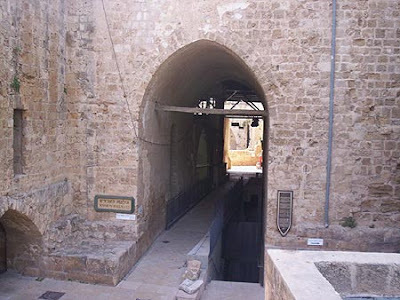 The entrance leads to a long network of tunnels and caverns under what's now an Arab town. 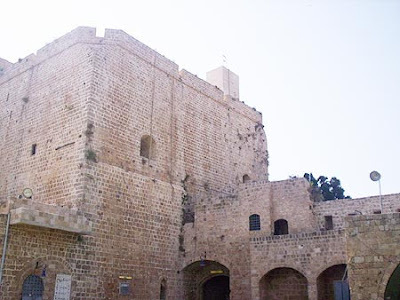 The fortress was used by the British in the 1940's to imprison and execute Jews. This is where the gallows hung many a prisoner. This is the actual site for the movie Exodus. The Druz, a Muslim cult, serve great German snitzel. Israel is a botanist's dream. Traffic lights and signs are only recommendations. Tomorrow for Day 5 we will explore the Sea of Galilee, but not walk where Jesus walked. Instead, we'll use a boat. Thank you for such wonderful pictures and commentary. I have never had the privilege to go to Israel, but I hope to some day. In the waiting I so appreciate being there with you all. Thank you so much for a wonderful tour. I look so forward to it each day. Traffic lights and signs are only recommendations... lol, love it.